The DA leader addressed members of a local Jewish community ahead of the elections. 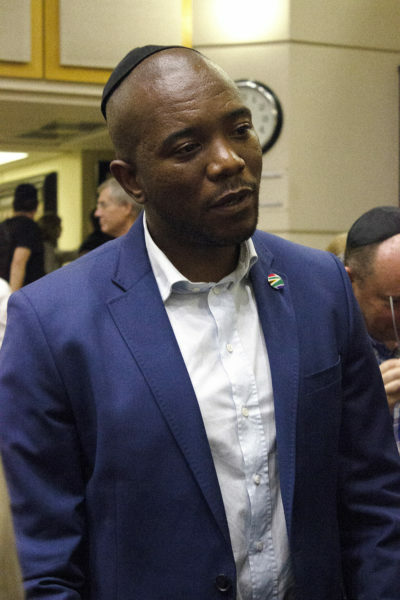 The Democratic Alliance’s Mmusi Maimane emphasised the need for social cohesion along with economic, educational and government reform as he addressed members of the Jewish community at the Sandton synagogue, Johannesburg on Sunday, April 7. He highlighted the work of Helen Suzman, the anti-apartheid activist who assisted political prisoners on Robben Island even though “these were men who were black and didn’t look like her; she was willing to put up a fight for them,” Maimane said. In terms of economic reform, Maimane talked about starting a job fund to help small businesses and talked about working with successful people, such as Adrian Gore , the Jewish founder of Discovery Limited. “What I want to do is partner with people like that so that we can build a country that can create work for our people”. He said the DA’s main focus during the upcoming elections was the ruling party. “The sole job that we have is to reduce the ANC (African National Congress) majority”. He pointed what he believed were the inefficiencies of the ruling party saying that too much is run at a national level. He used examples of unsafe road constructions as well as the lack of a viable police force. Maimane appealed to the Jewish community to keep contributing to the country, rather than to immigrate in fear. Georgie Keschner, a former Wits law student, said that although she was not necessarily a DA supporter she felt that Maimane “genuinely meant what he had to say”, and that she would be more inclined to give the ANC stronger opposition by voting for him.